Just like social media, stress is buzzing around our heads like bees in a hive. There is no end to the noise and there is no escape from it…what can we do about it? Stress can be good for our productivity and it can be detrimental. Like everything in life, it needs to be in moderation. When stress crosses the coping threshold, it can drastically change how you perform and how you function, not just in the workplace. Here’s what it may look like. When you have no stress, it could also mean you are bored…meaning little to no productivity. As stress increases, you start to feel the pressure to work and complete the tasks. There is a peak where stress provides you the maximum push to work, where you are still in control but feeling the urge to overcome the stress. However, when this state is sustained for a long period of time, you’ll feel powerless. The longer this feeling lingers, the more exhaustion you experience which leads to concentration breakdown and more likely to a loss of energy and prone to sickness. Long story short, when we have no stress, we do not perform to a satisfactory level. When we have the right amount of stress (this can vary from person to person), we perform extraordinarily well. When we have too much stress, that’s when anyone will crash and burn. What are some benefits of stress other than work performance? People are social beings, we value our friendships and companionship that link both our psychological and physical health. Research has shown that we seek out others for help and comfort when we are feeling stressed. This applies most effectively with team-related projects; everyone is in the same boat in coping with the stress associated with meeting deadlines and achieving the deliverables. Team coherence is not just determined by the job well done, it is also the process used to fight through to achieve the final result. Stress brings people closer together, when you are fighting the same fight, you become equals. Teams are also another way of combating over-stress, you share the load and you share the responsibility. Each person has their own tasks and roles, you feel empowered to do well. It is also easier to ask for help when the people that understand the task best are next to you. We all want to be stress-free, stress levels where we can manage and not feel overwhelmed. It is a dream that may never come true. Stress comes in all forms, we need something to motivate ourselves and stride forward even if the burden is heavy. One of the most important lessons to learn about stress is to tackle it head on, if you cower and hide, stress won’t wait for you to come out of hiding. It will make sure you have no-where to run. Face your stress and find out ways to deal with it, whether it is to look at the problem from a different angle or seek out someone else’s solution. If the task is unreasonably difficult to deal with by yourself, raise it with your manager. Plan your day and have a schedule. Nothing beats the feeling of completing tasks and being in control. List out a bunch of tasks that you are ready to do today and those that you think will carry over till the next day. If it is a big project, break it down into parts for each day, Rome wasn’t built in a day. Motivation and Positivity play a big part in staying ahead of stress, this can be attained by completing objectives. 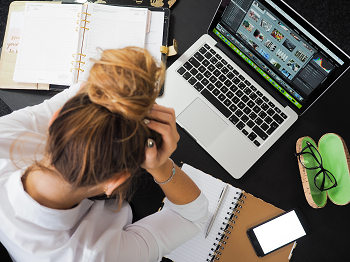 Having stress is not necessarily a bad thing, but having too much over a long period of time is damaging in terms of productivity health and well-being and interpersonal relationships. Watch for the warning signs and don’t leave it too late to do something about it! !